Researchers at the HZDR have calculated that the specific layout of four holes ("antidots") in a layer of cobalt will accommodate 15 different combinations for programming. CREDIT: HZDR. They also discovered that three magnetic states can be configured for every hole ("antidot"). The results of the research have been published in the Scientific Reports journal. Physicist Dr Rantej Bali from the HZDR worked in collaboration with scientists from the University of Western Australia and Singapore to develop a special grid structure in a thin cobalt layer to program its magnetic properties. His collaborators from the National University in Singapore developed the grid using a photolithographic procedure identical to the one currently used in chip manufacture. Approximately 250 nanometer-sized holes - antidots - were formed in the cobalt layer at regular intervals, including interspaces of only 150 nm. To stably program the grid, the researchers from Singapore employed the Dresden design, which specified a metal layer with a thickness of nearly 50 nm. 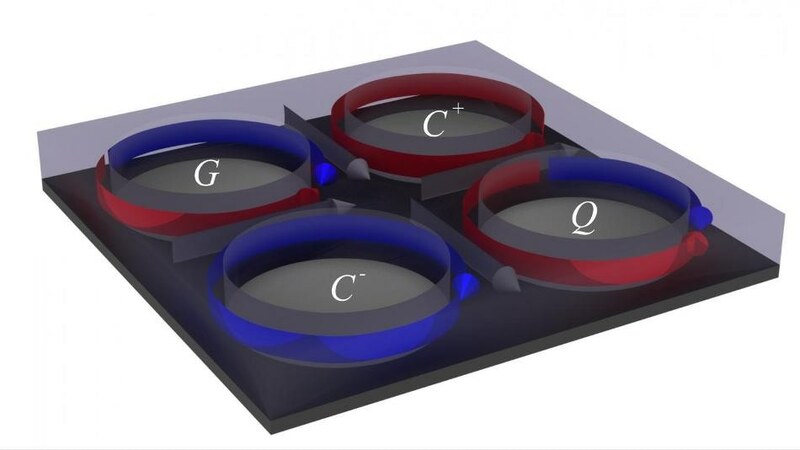 Fascinating properties of the cobalt antidot grid could be observed at these dimensions: the team headed by Dr Bali discovered that when a magnetic field was externally applied, three distinct magnetic states could be configured around each hole. These states were named “G,” “C,” and “Q” by the researchers. Antidots are now in the international research spotlight. By optimizing the antidot geometry we were able to show that the spins, or the magnetic moments of the electrons, could be reliably programmed around the holes. As the individually programmable holes are located in a magnetic metal layer, the grid geometry could potentially be used in computers that work with spin-waves instead of electric current. Spin-waves are similar to the so-called Mexican waves you see in a football stadium. The wave propagates through the stadium, but the individual fans, in our case the electrons, stay seated. The power consumption of the logic chips that use such spin-waves is much less compared to prevalent processors. This is because there is no need for electrical current. Many magnetic states can be achieved in the perforated grid such that, for instance, specific directions can be assigned to the spin-waves. This can pave the way for a greater processing speed of the logic chips in future. Our perforated grids could also operate as components for future circuits working with spin-waves. Tobias Schneider, a Doctoral candidate, is currently working on the analysis of the dynamics that the spin-waves develop in such perforated grids. In addition to other aspects, he is participating in the development of special computer programs that enable the complex calculation of the magnetic states in such perforated grids.